As you may know, I’m participating in the 2018 Trailblaze Challenge for the Alabama Make-A-Wish Foundation. You may read more about it HERE (https://jnunniv.blog/2017/11/04/help-me-help-others-2018-trailblaze-challenge/). Not only am I raising money for the Make-A-Wish Foundation, the physical challenge is hiking 26.3 miles on the Pinhoti Trail in one day. That’s not something I can just wake up and do without preparation, so I wanted a baseline of where I stood and just how much training I needed to be ready in May for the official hike. I figured the best way to assess this was to hike around half the distance in one day and time myself. 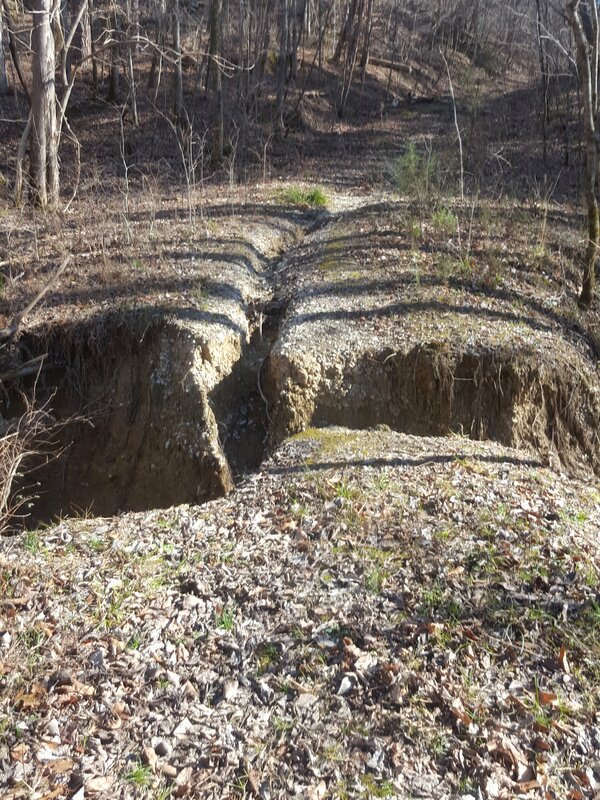 After looking at the map and the weather, I decided on a route in the Sipsey Wilderness that should keep my feet dry but be challenging. 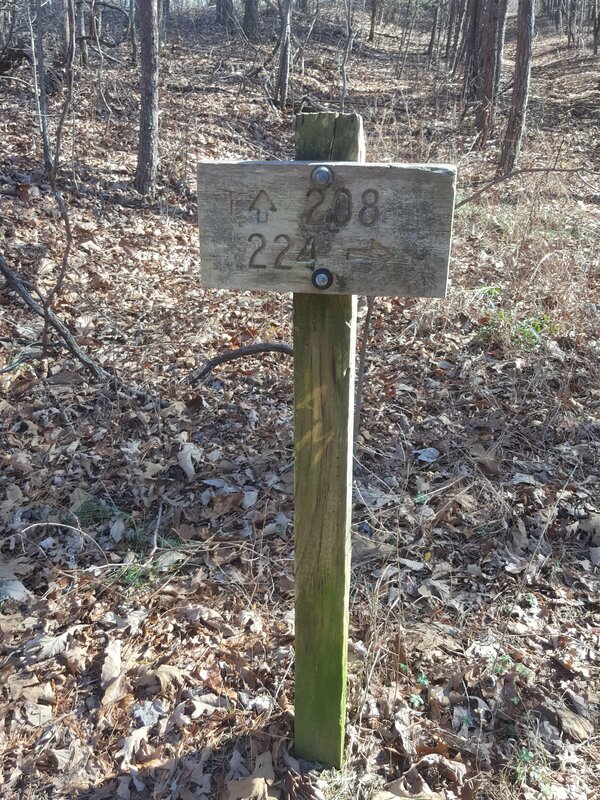 I decided to park at the Gum Pond Trailhead and do a loop of trails 210, 223, and 208. This hike would accomplish three things. 1. It would give me a baseline for time and distance. 3. Give me an honest assessment of my physical ability. I haven’t been to the gym, hiking recently, or prepared for this in any way. Keeping with my plan, I left the house early and arrived at the Gum Pond Trailhead. 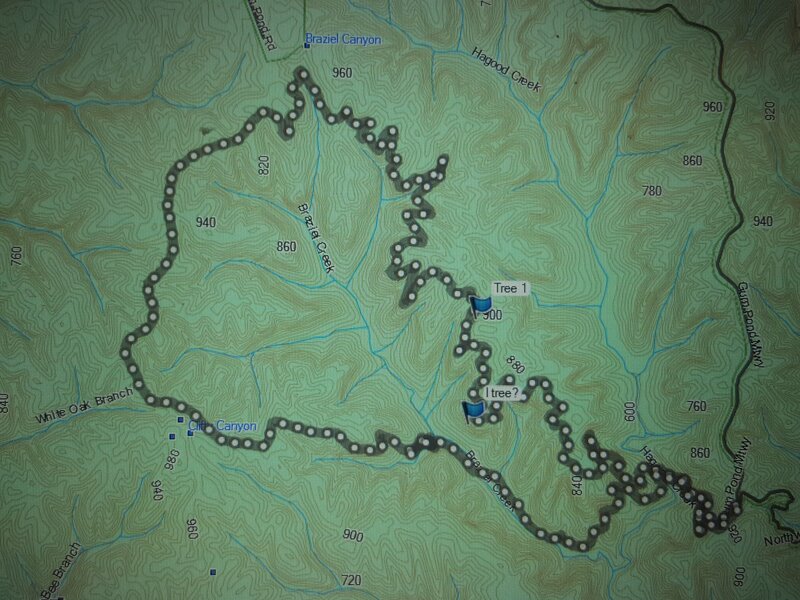 I powered up my SPOT device, sent my initial Check-In message (8:05 am), and got ready to hike. Knowing that layering is the key to hiking, I was wearing everything I brought with me in the beginning as the temperature was hovering around 20 degrees. I was a bit cold, but I knew that would not last long. 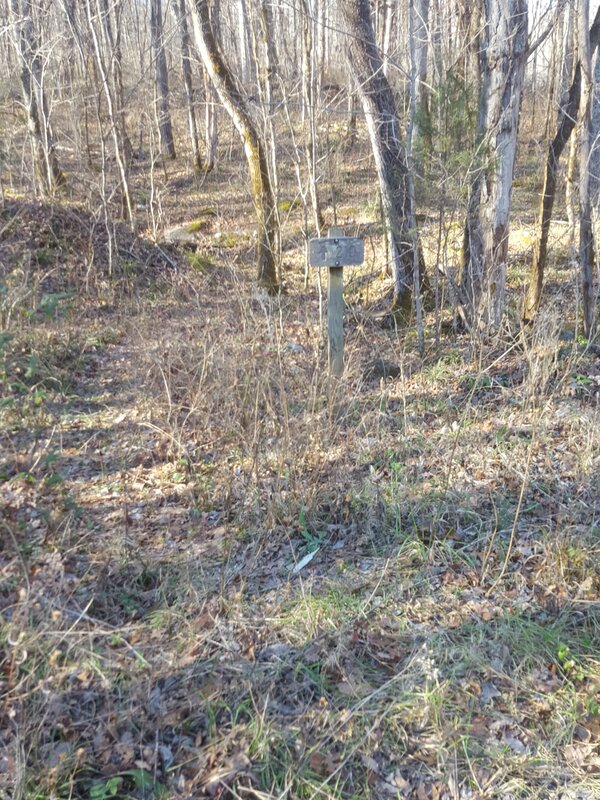 Trail 208 is an old road traversing the Sipsey Wilderness and is one of the few trails in the Sipsey Wilderness that horses can be ridden. It is wide and easy to follow. I headed down trail 208 and 0.4 miles later came to the turn-off on my left to trail 207. 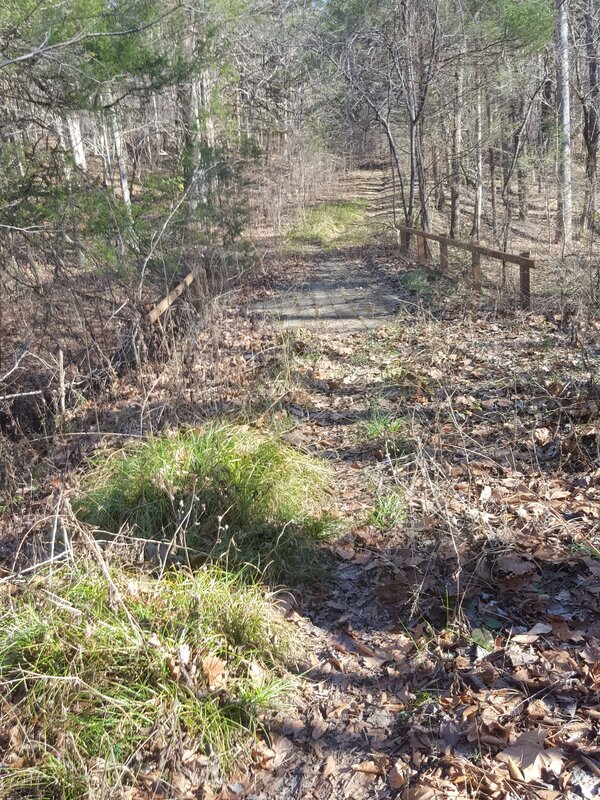 I had initially considered including this trail in the loop but remembered there was a water crossing on Borden Creek on the southern end of the trail. Considering the temperature, I wanted to keep my feet as dry as possible so I decided against it and continued straight on Trail 208. I continued downhill and crossed Hagood Creek using the bridge there. 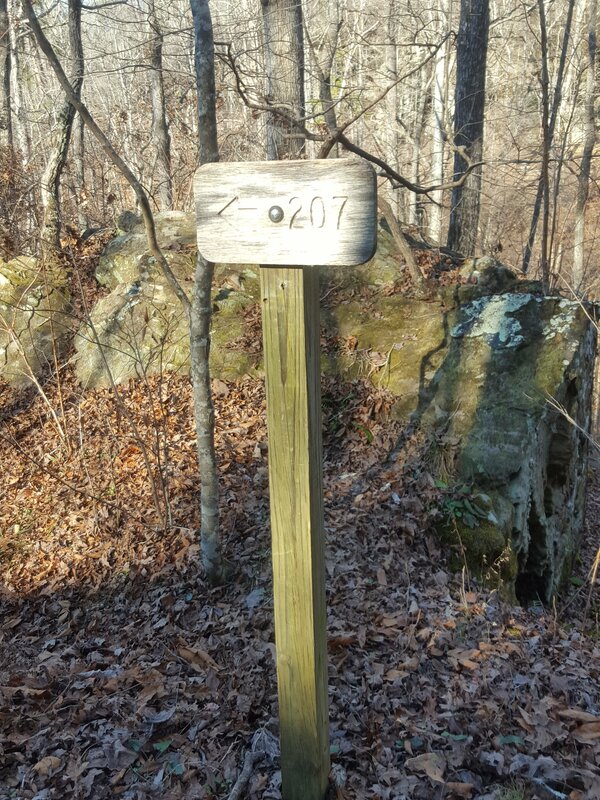 After another 0.4 miles, I arrived at the sign to Trail 210 on my right. 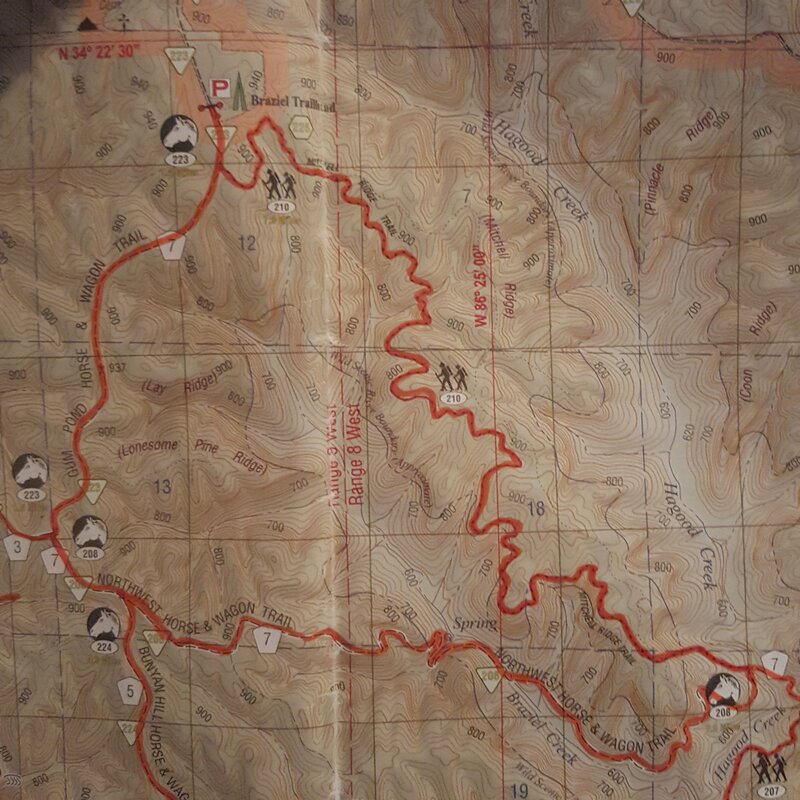 When planning I had decided to travel the most difficult of the trails first and leave the easier trails for the end. This was both a good and bad decision, but I turned onto Trail 210 and immediately began climbing up the hill. 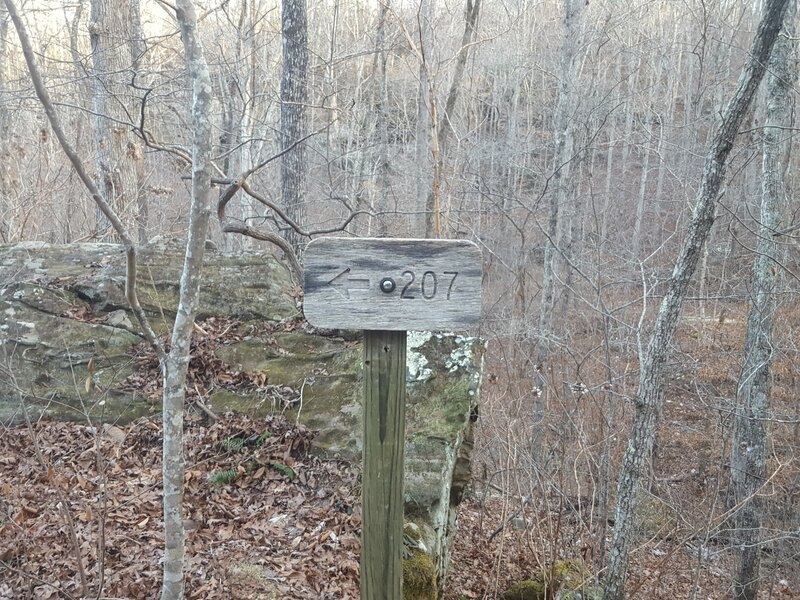 PLEASE NOTE: Trail 210 is one of the least used trails in the Sipsey Wilderness and I would not recommend for a new hiker unfamiliar with the area. It is more difficult to follow that some of the more used trails that read like an Interstate. To me, that is the appeal of this trail. 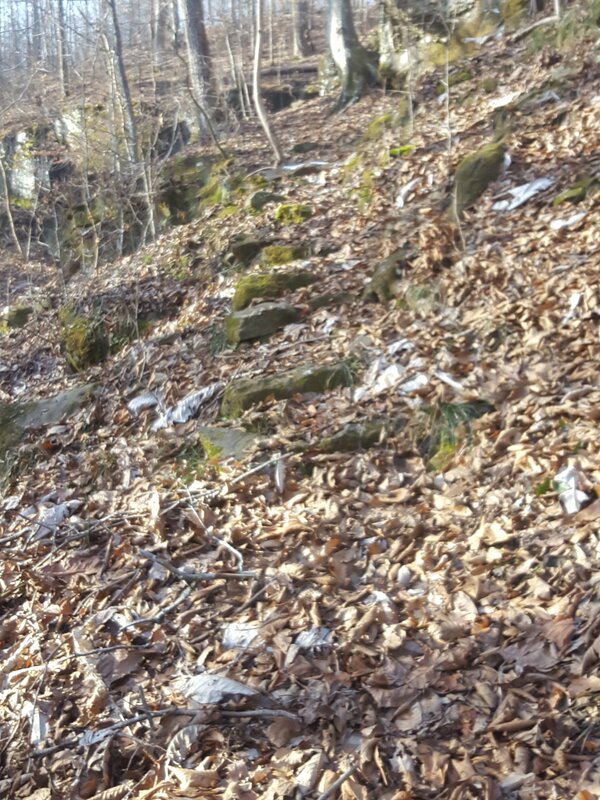 If you pay attention, it is not difficult to follow and since it is a ridge trail, offers views (especially in the winter when the leaves are off the trees) not often seen on most of the other trails that follow water. Speaking of water, there is water on the trail, but most of it is on the northern end of this trail. 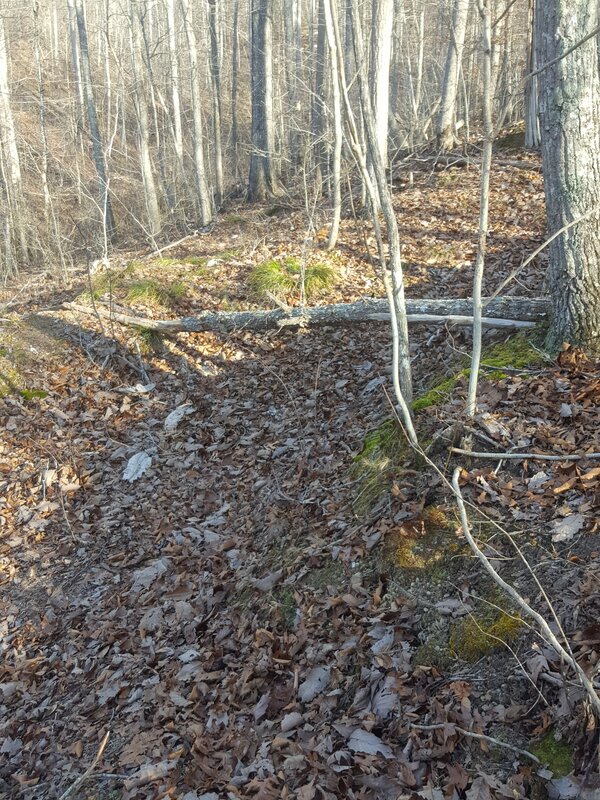 The first time I hiked this trail I did not realize the trail climbs up on the back of the ridge. It does, so be prepared for that. 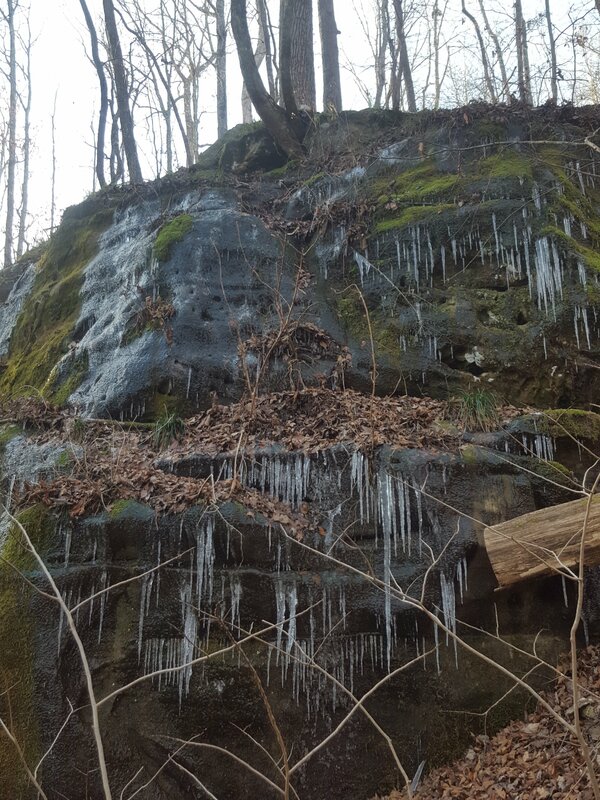 After climbing the hill, the trail hugs the back of the bluff and many icicles were there to greet me. As I followed the bluff around, there is the first manmade signal that the trail turns. There are rocks curving to the left. To the casual observer, you may miss these and continue straight. As you turn to the left, a series of steps can be seen climbing up to the top of the bluff. This is where I took of my down vest and gloves and stored them in my pack. For the rest of the day, I just wore a long sleeve synthetic shirt over a thin wool T Shirt with convertible hiking pants and a wool toboggan. The lack of traffic and the numerous leaves did make following this trail somewhat challenging and kept me on my toes more than once. In MANY places, logs and/or rocks have been placed as a signal. 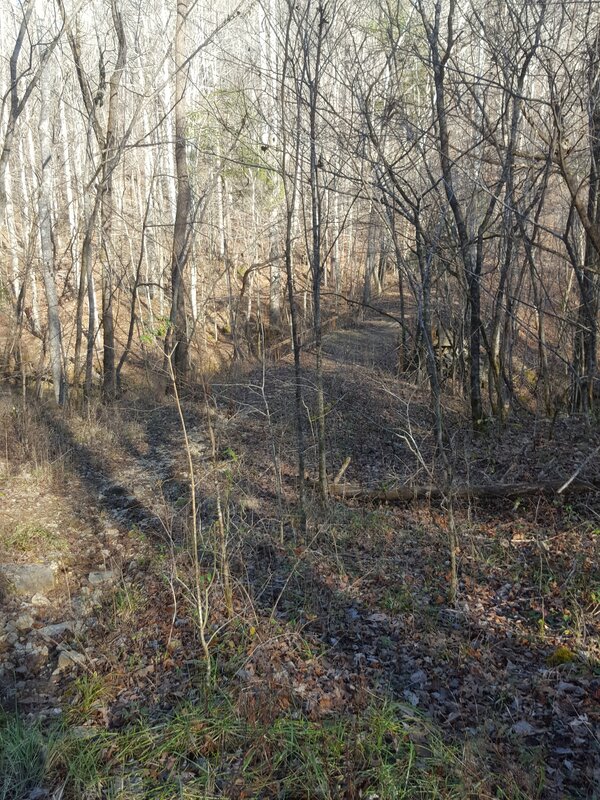 There are many old roads on this ridge and the trail meanders in and out of them. 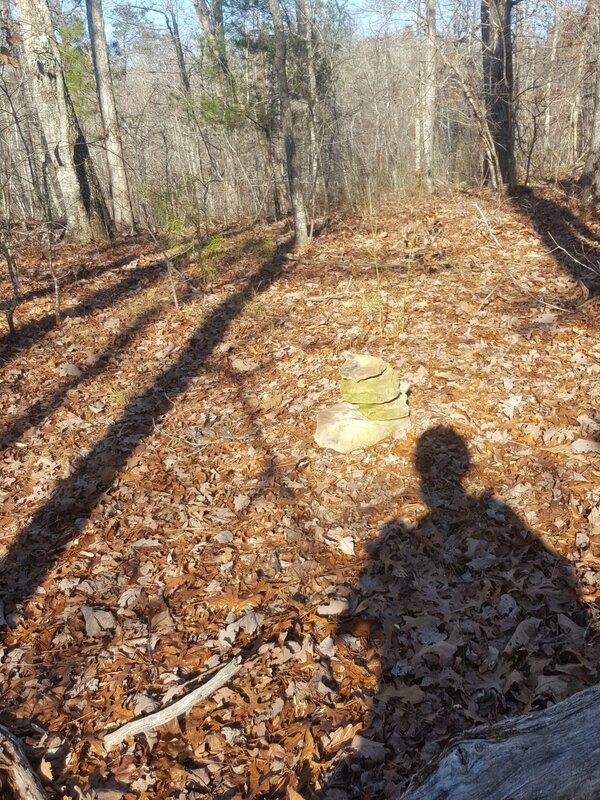 Logs placed across the trail are almost always a signal. 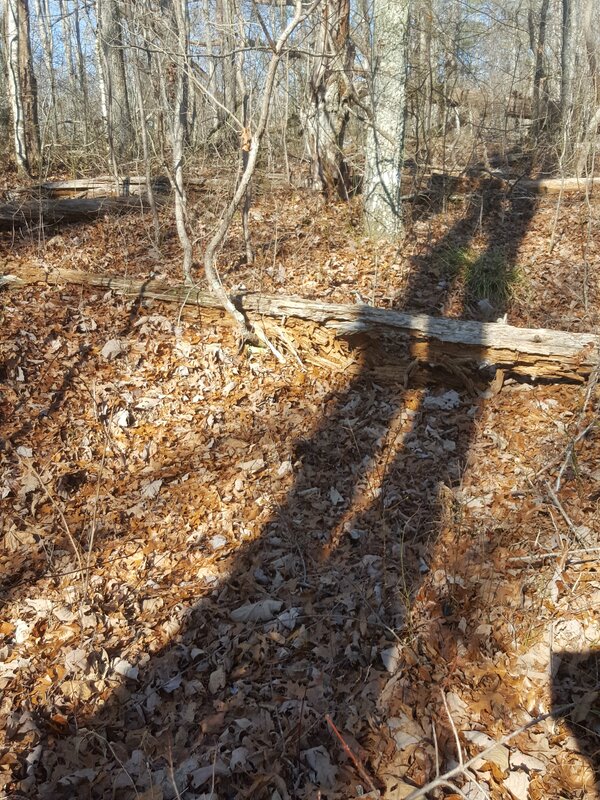 As you climb, this log signals the trail turns to the left and begins to follow the road for a short distance. After a short distance, you cross another road and for some reason I wanted to turn right. This small tree is a signal the trail crosses this road and continues straight. 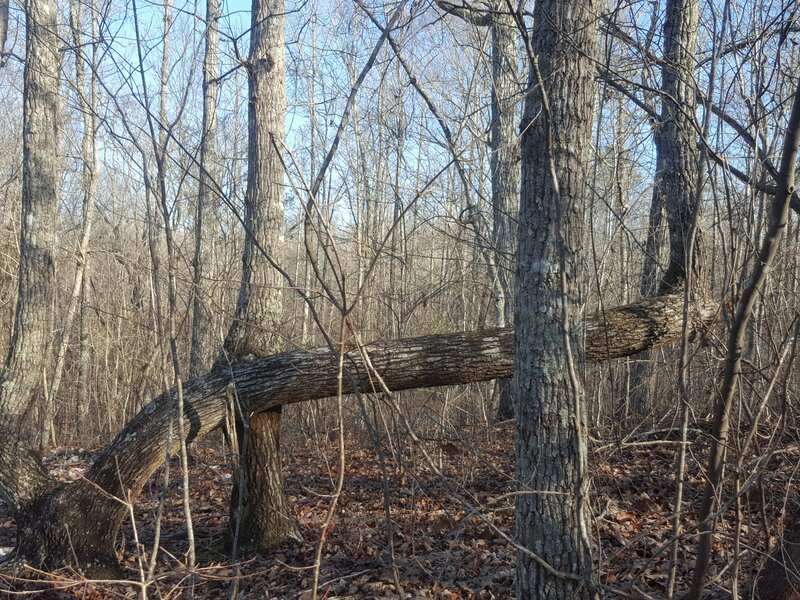 I noticed this tree the last time I hiked this trail and it appears to be an Indian Marker tree. Taking a compass reading at the ‘point” on the left, it points straight to the spring on 208 halfway between the intersection of trails 208/224 and the intersection of trails 208/210. Not much further there appears a pile of rocks alongside the trail. 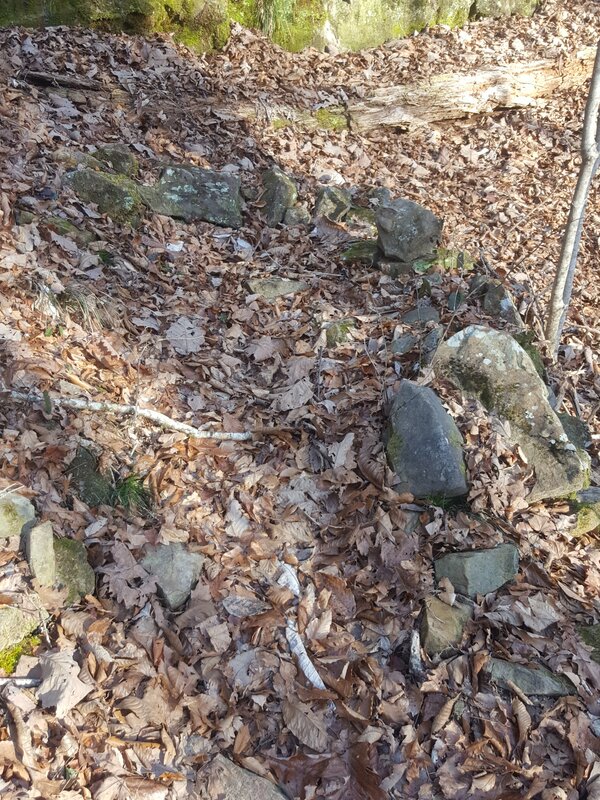 It took me a few minutes to figure out the trail turns to the right here. 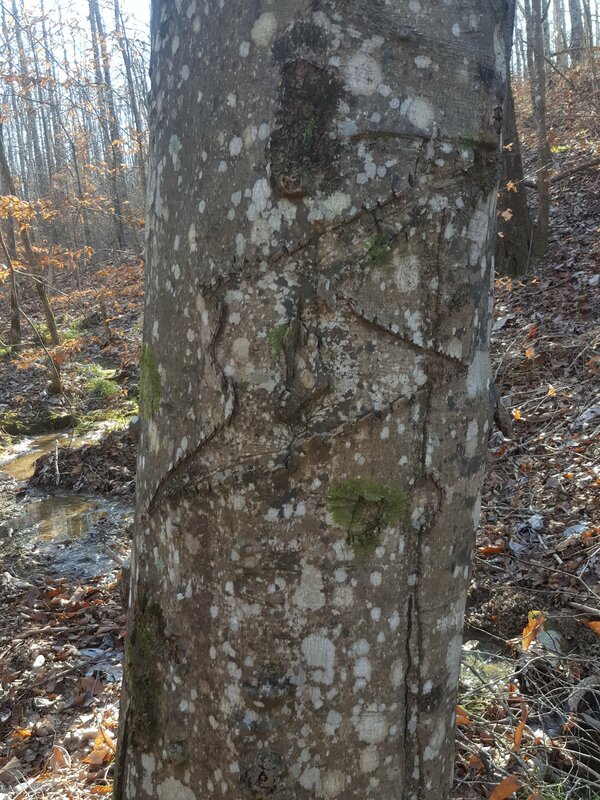 Another interesting site along this trail is this tree carving. It has been here a long time but I have no idea what it means or why it is there. 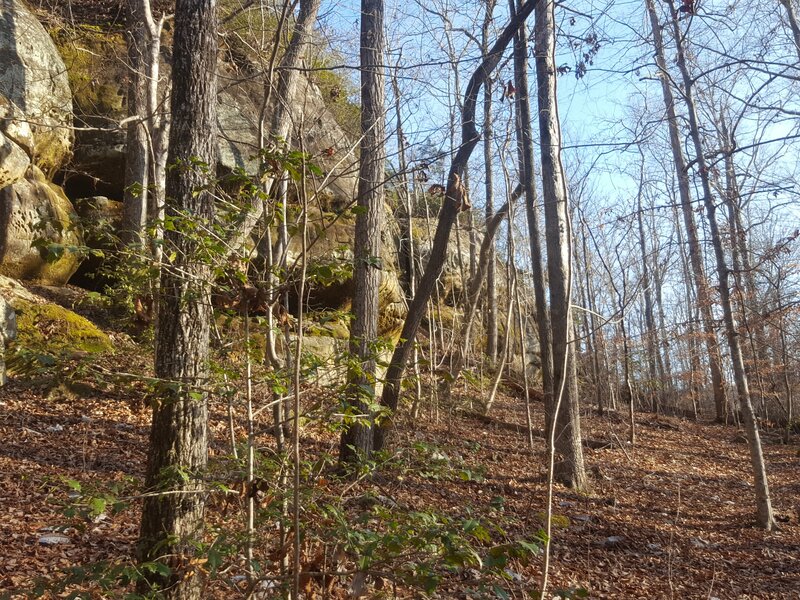 For the most part, Trail 210 is easy to hike once you learn the “personality” of the trail. It wanders along the ridge line and often you can see both where you are going and where you have been at the same time. 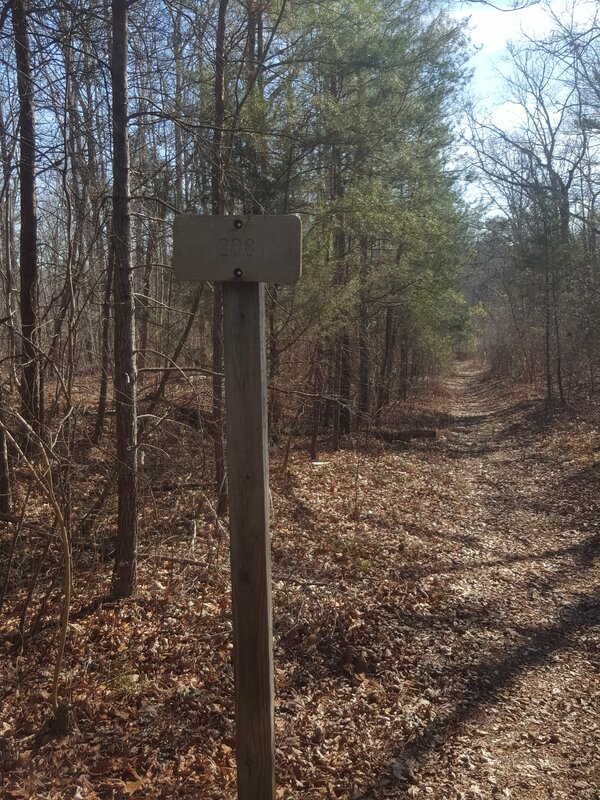 The trail turns to the left. 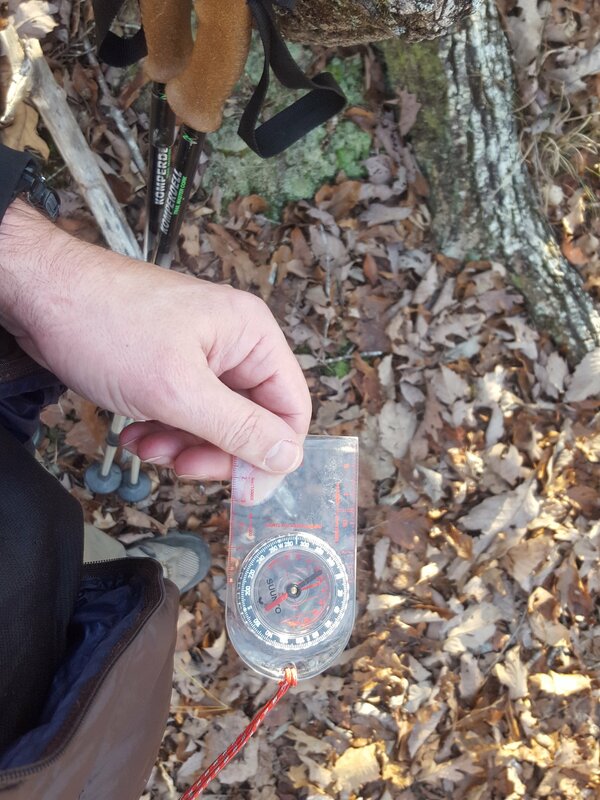 I think it was at this point I checked my SPOT device and realized it wasn’t tracking. I have it set to drop my location every 10 minutes. I check my Gaia GPS app and it wasn’t recording either. Double electronic failure! I turned on my tracking on my SPOT and restarted my phone and began recording another track. I also moved my SPOT device to my shoulder strap so I could ensure it was working without removing my pack. 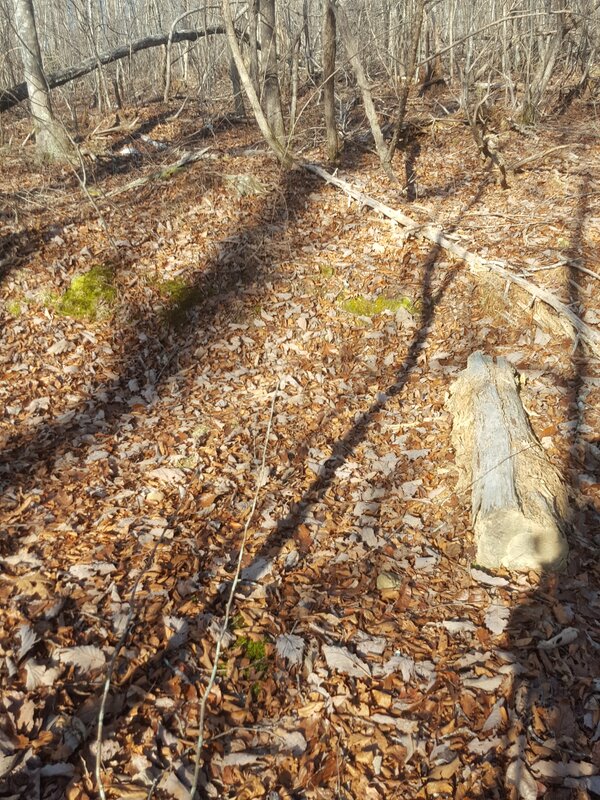 Here’s another log signaling the trail turned to my left. 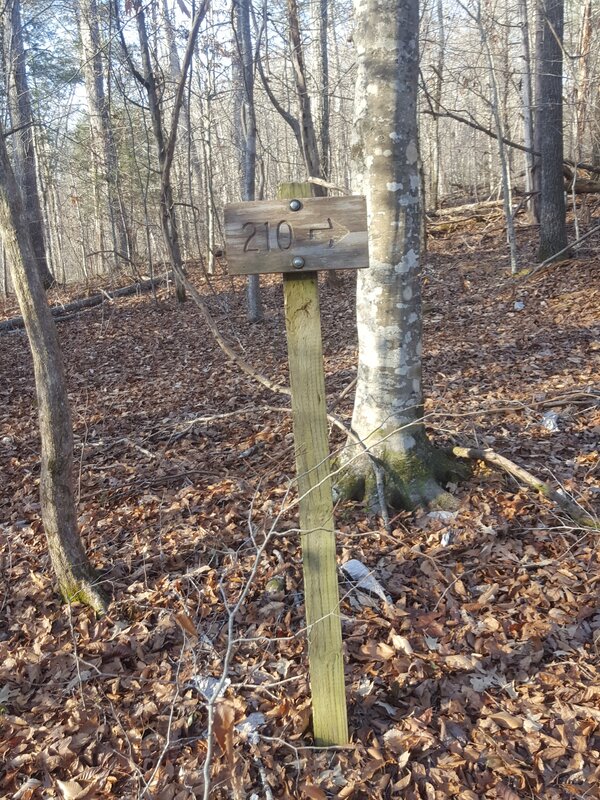 Over 7 miles into my hike, I arrived at the intersection of Trails 210 and 223. 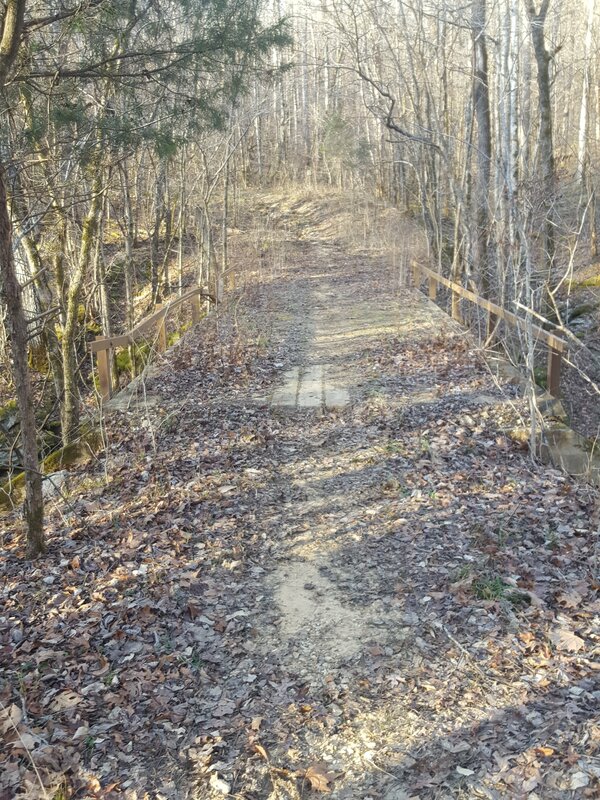 I was roughly halfway done with my hike and the rest of the way was old roads/horse trails. 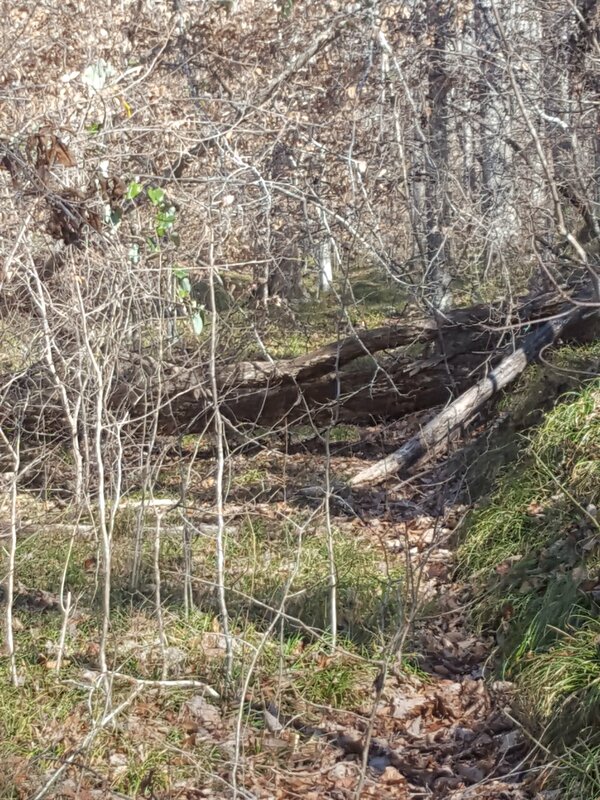 I wouldn’t have to look for the trail – it’s like an Interstate compared to the pig trail I had been on for the past several hours. I made quick time traveling down the mile and a half to the intersection of Trails 208/223. I took a quick break to sit down and stretch out my legs and have a snack. Turning left, I began the last trail of the day. Just a few minutes later and 0.4 miles I came to the intersection of Trails 208 and 224. I continued straight. As a note, the trails that allow horses on them have a tendency to be churned up and muddy at the smallest bit of moisture on the trailbed. Trail 208 did not disappoint me in this aspect and parts were quite muddy but partially frozen. I managed to keep dry feet the whole way although my shoes did get quite muddy. I FINALLY arrived at the spring just west of Braziel Creek. I had been looking forward to this for some time. I needed water, food, and a few minutes of rest. I filtered 3 liters of water and took about a 30-minute break for a late lunch. 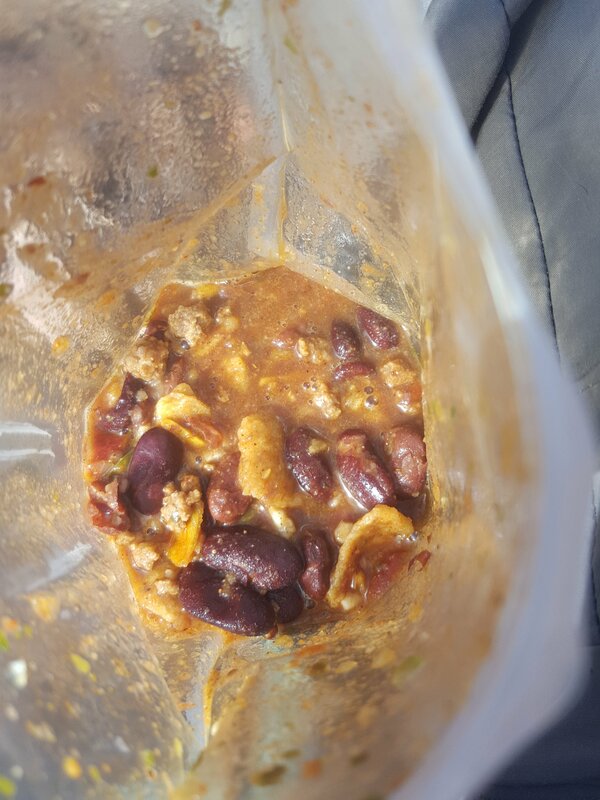 I ate Texas State Fair Chili from Packit Gourmet (https://www.packitgourmet.com/Texas-State-Fair-Chili.html) and it was DELICIOUS as always and drank about half of my water. I quickly got chilled and had to put on all my gear including a rain jacket to block the wind. I topped of my water bottle and decided it was time to finish this hike. Leaving the spring, I quickly reached the bridge crossing Braziel Creek. This was crossing a feeder creek to Braziel Creek just east of the bridge. I don’t remember it being there from my last hike on this section of 208. It was only about 3 feet across and I easily jumped across the gap and continued along my way. After what seemed like forever, I finally arrived at the intersection of Trails 208 and 210. I wasn’t about to do another loop today and said my goodbyes to the sign. I also knew from earlier I was less than a mile from my car. 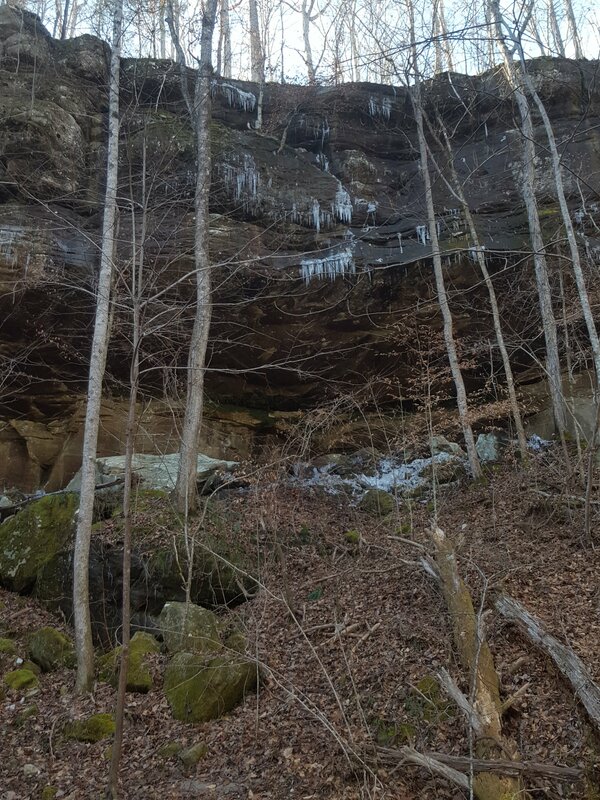 The bluffs along 208 still had plenty of ice on them as I continued up the hill. Finally, I had the bridge in sight! 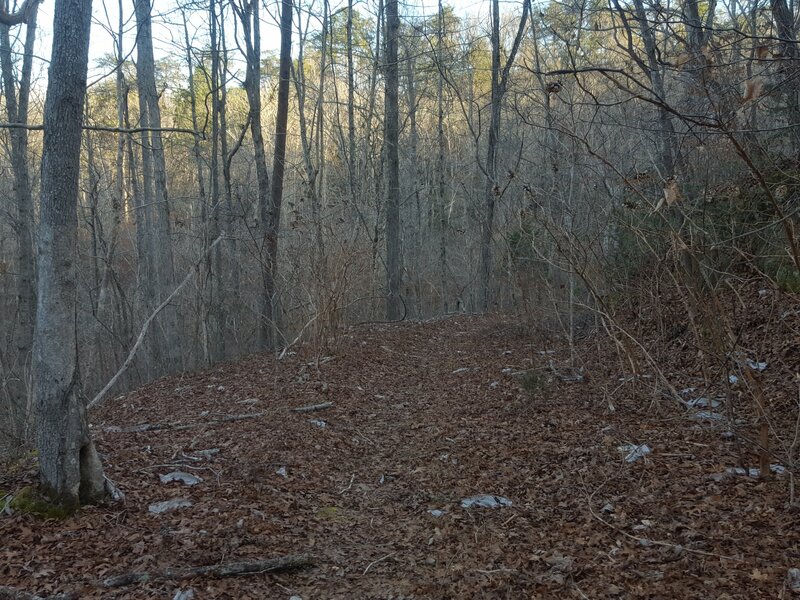 As a note, once you cross Hagood Creek, it is uphill all the way to the Gum Pond trailhead. I had forgotten this little detail and my legs were starting to feel it. Halfway to the car from the intersection of Trail 210 I once again saw the sign for Trail 207. I wasn’t about to turn now – I was too close from finishing! FINALLY. I made it to the car. I sent my final Check-In message signaling my family I had finished the hike and I was on my way home. The Check-In message was sent at 2:19 pm. After I returned home, I joined the two tracks from the Gaia GPS app and realized I had hiked 15.2 miles between 8:05 am and 2:19 pm. I think that’s pretty good time in the Sipsey Wilderness considering that includes breaks, lunch, and navigation issues. I like the SPOT GPS Satellite Messenger and so does my family. I will continue to use it but move it to my shoulder strap so I can just glance down and know that it’s working by the blinking lights. I didn’t drink enough water on Trail 210. I knew there wasn’t any water on Trail 223 and not for several miles on 208. I should have stopped to drink and filter water on Trail 210 as there were several opportunities. I should have taken more snacks. By the time I got to lunch I was hungry. A few snacks on the trail would have given me more energy and I probably would have felt better. I need new shoes. I have been debating on getting some trail runners and I think I’ll make the change from my Merrill Moab Ventilators. Thanks! I read the comments, but just now getting to replying to your comment.